That was 7 years ago. That Coffee Bean & Tea is now closed. I drew that with Brushes on an iPod Touch. I see now that Brushes has since become free software. That’s pretty cool, I think. You can program on the thing yourself–just download the source from Github and go. The Coffee Bean & Tea has been good to me in the past two weeks. 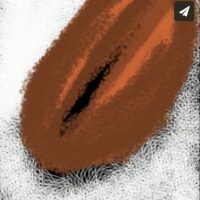 Here’s a coffee bean of thanks, courtesy, AGAIN, Brushes.app. 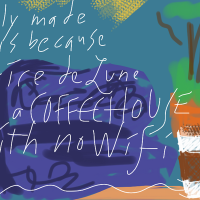 I only made this because Claire de Lune is a COFFEEHOUSE with no WiFi.